Guava is a tropical fruit that originated in the tropical Americas. It is believed to be a native of Brazil. Guava has a Spanish name which comes from its native Latin American source. Guavas grow on trees and there are about 150 varieties of this tropical fruit. These tropical, tantalizing fruits range in shape from round to oval to pear-shaped. The most common variety of guava is yellow, but the colours of the other types of this tropical fruit can be white, yellow, red, purple or black. There are some varieties that have a soft rind that is edible as well as their small seeds. Their flavour ranges from sweet to tart and they have a pleasant aroma. Among the many tropical fruits we enjoy, guava is one of these mouth watering fruits that are not often mentioned when it comes to nutrition. Guava delivers more vitamin C than a medium sized orange and it also delivers ten times more vitamin A than a lemon. Vitamin A is important for healthy eyesight, glowing skin and strong bones. Guava is an excellent source of fiber which promotes regularity. It also delivers other important vitamins such as vitamin B2, vitamin E, calcium, folate, iron and potassium. Guavas are rich in antioxidants and help to reduce the risk of certain cancers. Select guavas that are fully ripe so that they are soft and easy to chew. 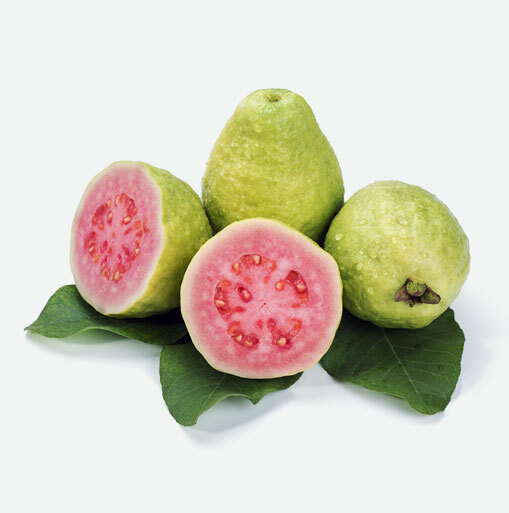 The tastiest guavas have an appealing, rich aroma. Choose guavas that give to gentle palm pressure but that have not yet begun to show spots. Store green guavas at room temperature and ripe ones in the vegetable crisper of your refrigerator for up to three days. To speed up the ripening process for guavas, put them in a paper bag with a banana and leave them out at room temperature until the guavas begin to soften. Make sure you check the fruits daily and use them before the darker spots start to appear. This delicious tropical fruit makes a great snack. Guavas are great in fruit salads, smoothies and they can be cut up and juiced. Try some guava juice and you will find it delicious and refreshing. Guava can be eaten out of hand for a snack, but it is usually sliced and seeded and used in salads. Guava can be used in pies, cakes, breads and cobblers. Guava can also be used to make jams, jellies and sauces.